I have a love-hate relationship with the winter. For example, there is a lot that I can find to like about winter - white fluffy snow, warm fireplaces, hot beverages, flavourful soups and stews, cozy clothes, skiing, skating etc. What I really dislike about winter are the short days. This is what I mean. Here it is not even three o'clock in the afternoon on a sunny day and the shadows are very long. I am not six feet tall. I have always wanted to be taller than my 5 feet and a wish in height, so you can gather just how far along the day is. Just as an aside, apparently taking pictures of one's shadow is something photographers do a lot. 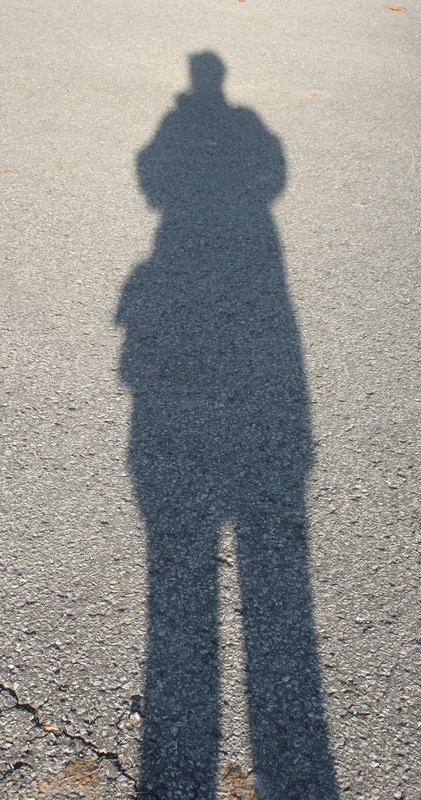 One of the sites that accepts pictures for sale had some guide lines and the first one was - do not post pictures of your shadow. I didn't think that photographers were particularly narcissistic; but I guess since they are always behind the camera, they have found a way of taking their picture - sort of. Anyway I have posted this picture as "dislike" in the scavenger hunt, because I really dislike the short days of winter - the solstice is coming, though and things will get better!!! Winter, on the other hand, is a great time for knitting - the love side of the hate. I have had plenty of time to work on samples for my new teaching venue - almost half way through Sycamore Scarf, based of the bark of the Sycamore tree. Winter is also a better time to look at patterning in nature too. You can see the branches of the trees. Bark stands out quite dramatically against the white of the snow. Interesting shapes appear in the spare landscape - but you do have to squeeze all these "things" into very short days.